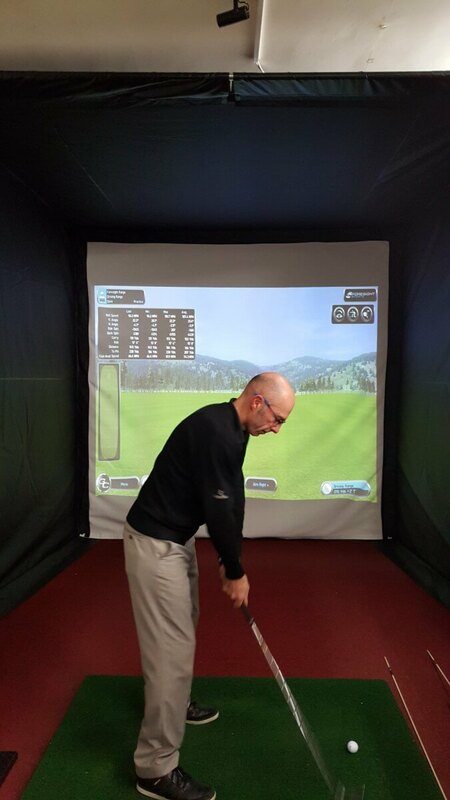 Golf Swing Systems can help you as a business or as an individual choose the right golf simulator for you. We pride ourselves on offering an independent and unbiased view on what technology is on the market. 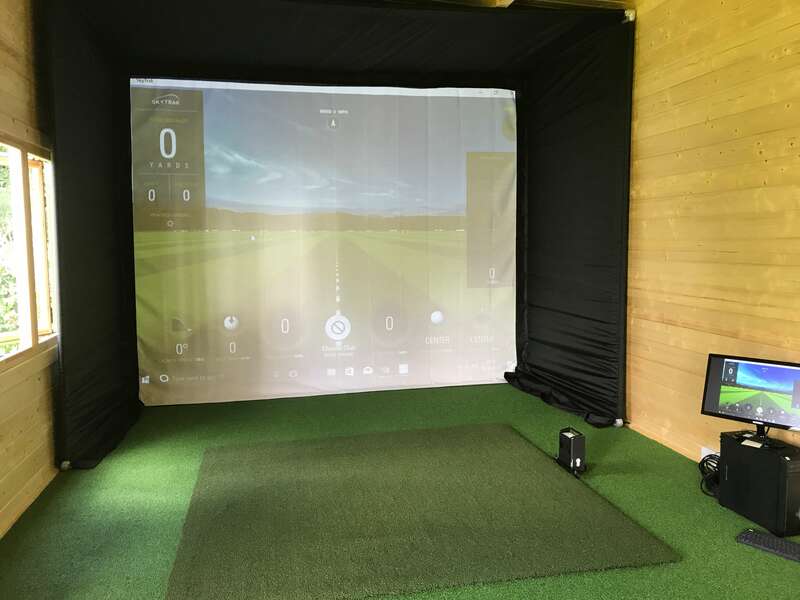 It is often hard to know which product is best for you, so don’t hesitate to get in contact with Golf Swing Systems – we can guide you through the range of golf simulators available. 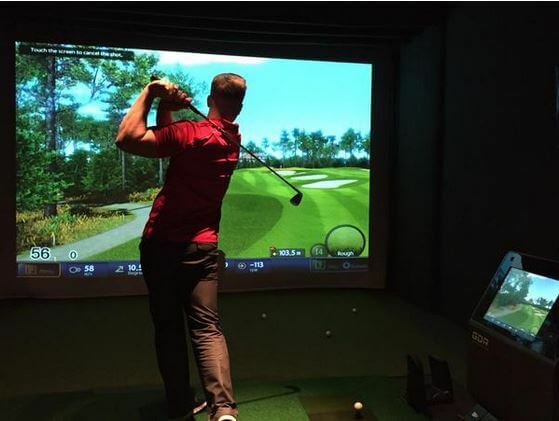 What does a golf simulator cost? 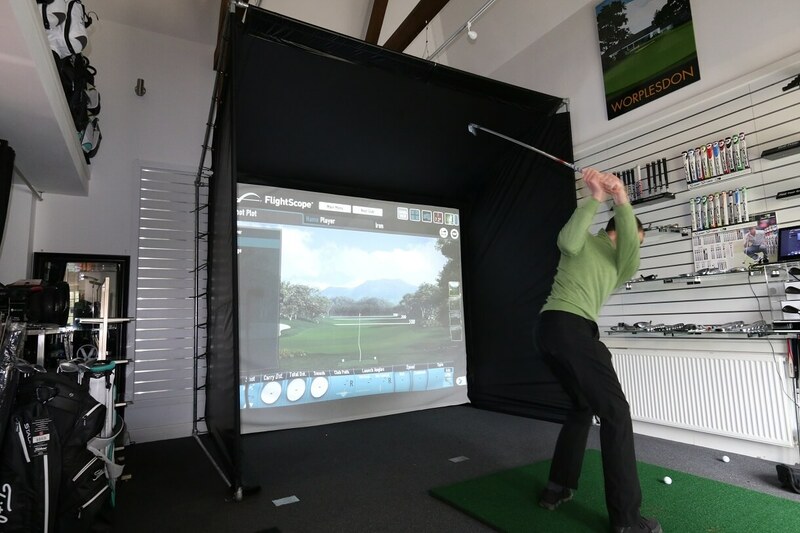 We provide a large variety of golf simulators across a range of budgets. 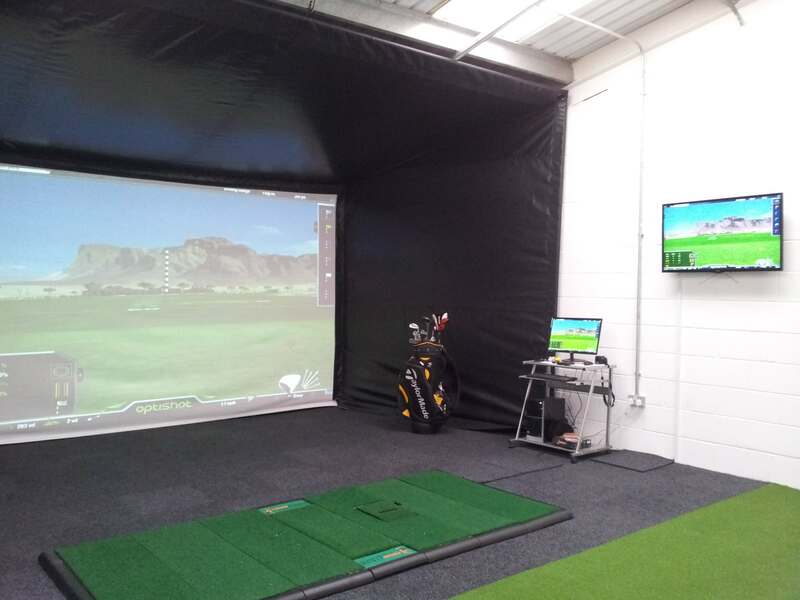 As an example, our SkyTrak Launch Monitor & Golf Simulator is available from £1895.00 while the Optishot 2 Golf Simulator with a screen and mat is available from £853. 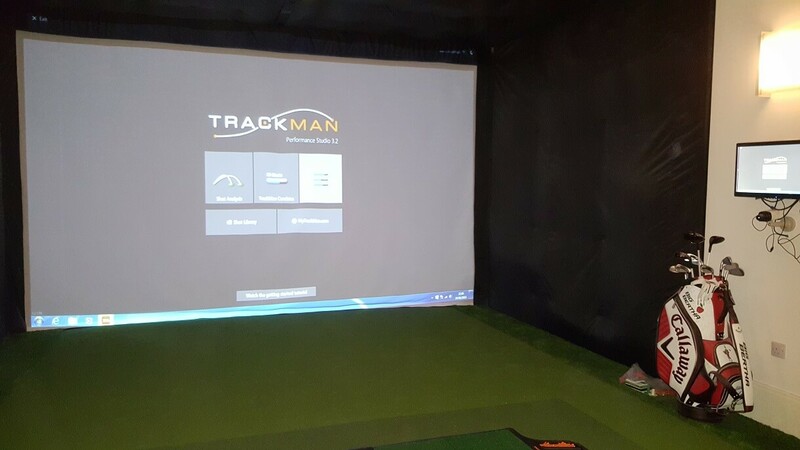 If you are looking at more commercial systems that the custom fitters and PGA Professionals use then maybe Trackman at or the Foresight Sports GC2 or GCQuad may be the systems that suit your needs. We can help you make that decision by giving you all the information and how they can help your game. It all depends on your specific needs and requirements. We are happy to provide any impartial advice and guidance you need. How much height do I need? You will need around 8 and a half feet (or 2.6m) of height as an absolute minimum, but ideally 10 feet or 3M.This then allows you to have the projector ceiling mounted without the need for either a horizontal keystone projector or casting a shadow of the player on the screen. How much width do I need? You need a width of at least 9 feet (2.7m). This would give you a projection screen of 2.7M Wide x 2.03M high on a 4:3 projection picture which would look like the picture below. How much depth do I need? You need a minimum depth of 16 feet (4.5m). How far from the screen can I tee up from? You can tee up from a minimum of 8 feet (2.5M) away. How far off the back wall must the screen be? It needs be at least 1ft (300mm) away from the back wall. 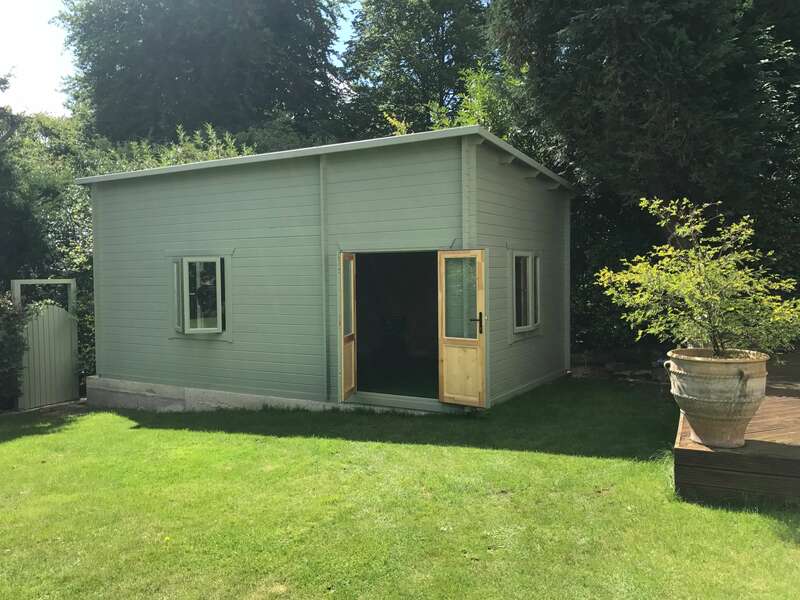 We have the space available, so what can we put into it? This is where can help you with our wealth of experience. 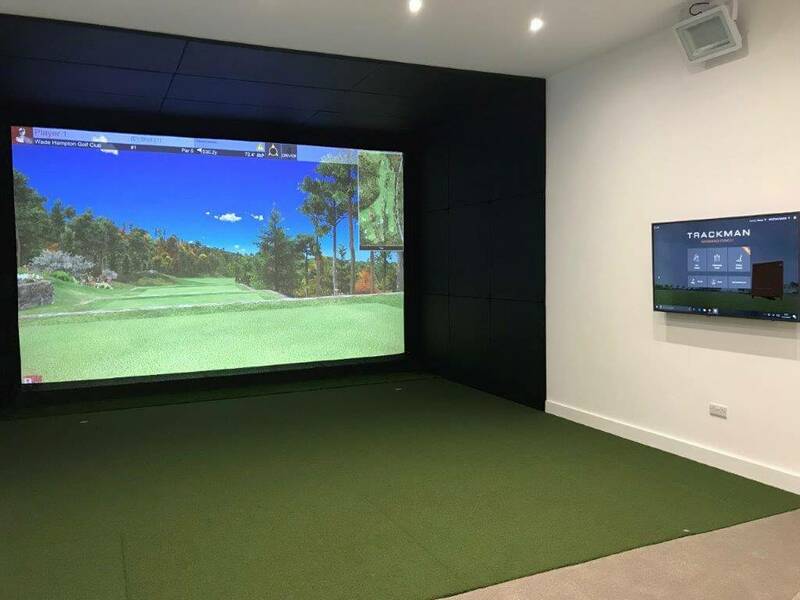 Firstly, with our made to measure golf enclosure system which includes a frame, all in one enclosure with no gaps between the roof, sides and back wall and a projection screen made-to-measure for your golf room. All we need are either the dimensions you want or the room dimensions that you have. We can then give you a price on that size golf enclosure. Are they easy to put together? Yes, they are easy to erect and come with instructions. They are strong, durable and lightweight. 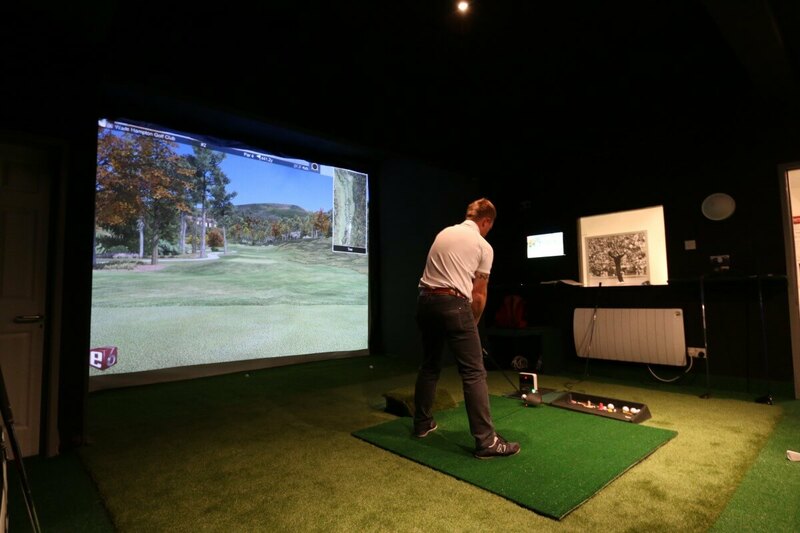 Which golf simulator can the golf enclosure work with? They can be used with any golf simulator. We have our enclosure, what projectors should I get and where can I put the projector? There are thousands of projectors in the market place and they all do different jobs depending on the brightness of the room, size of picture required, quality of picture required and position of where the projector can go. For example, this is a short throw projector position on the floor and covered up for protection 10 feet from the screen giving a 4:3 Ratio 13 1/3 feet 4M wide x 10 feet 3M high. Projectors usually work on 3 different ratios 4:3 16:9 and 16:10 so, for example, a picture 13 1/2 feet wide x 10 feet high is a 4:3 ratio. 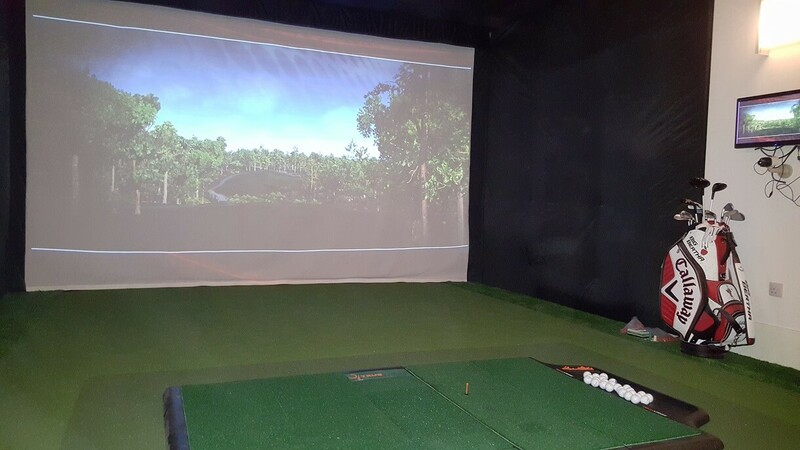 Golf Projection screen that are smaller than 13 ½ feet wide therefore have a gap at the top and bottom as the width is filled on the 4:3 ratio but not the top. 16:9 Ratio projector 16 ½ feet wide x 10ft high with the projector suspended from the ceiling 20ft from the screen. The most popular way to project is hanging from the ceiling and most projector manufactures provide a projector that can produce a 4:3 ration filling a 13 1/3 feet wide x 10 feet high screen from 13 ½ feet from the screen as pictured. As you can see the projector is suspended from our golf simulator enclosure which is 13 ½ feet wide x 13 ½ feet deep and 10ft high. Projectors with side horizontal keystone are a great idea if you don’t want a short throw projector on the floor. Take a look at the Latest Cabin Design for gardens. This is the ideal size for a golf simulator leaving room for the golf swing and space for your friends. Contact us on +44 (0) 2081441550 or email sales@golfswingsystems.co.uk to discuss your requirements. Whether it’s the latest SkyTrak Launch monitor with TruGolf software, the Optishot Golf simulator for the home with a projection screen, or a top of the range GC2 for Clubfitting, a Trackman TruGolf Simulator for the basement, or the New Golfzon GDR Coaching Simulator for the Driving Range. 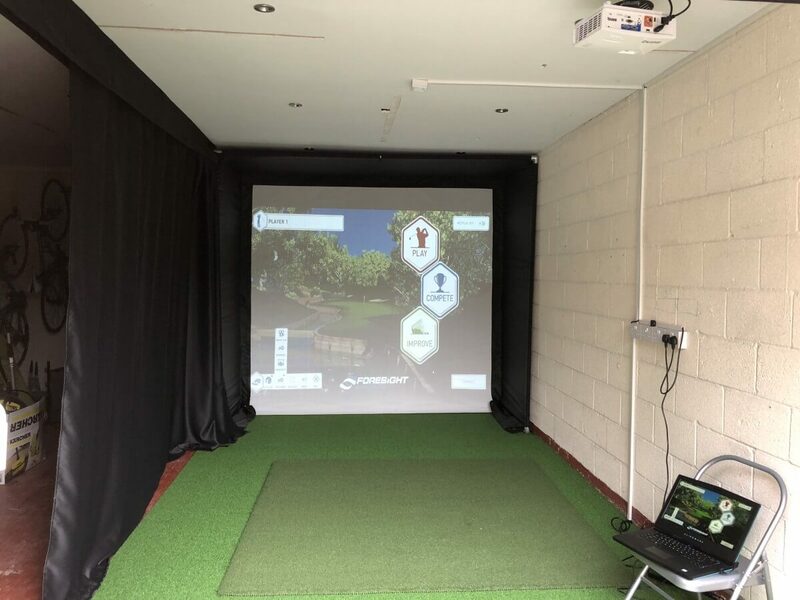 We can put full packages together for you from home projects in the barn or garage to professional working academies at golf clubs, to indoor coaching studios. We cater for all. Trackman 4 Uses dual radar technology which picks up the Ball and the Clubhead. 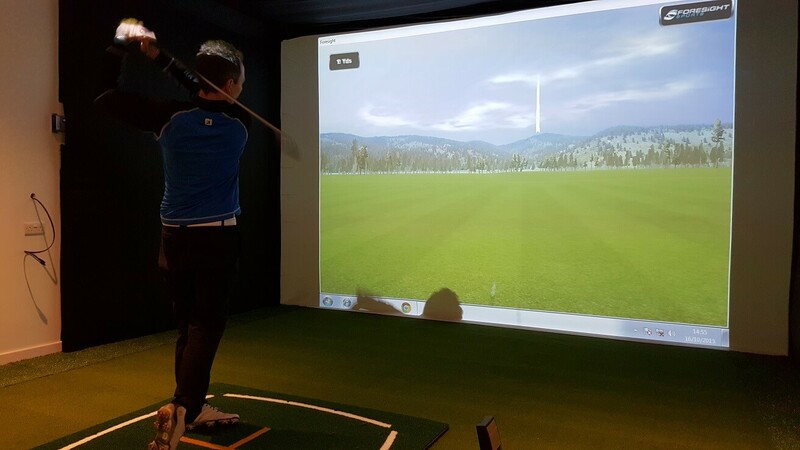 For use as a golf simulator it uses the Tru Golf E6 Software You must have 5M of Ball Flight from the Trackman to the Screen. Flightscope again uses Doppler Radar and needs 7M from the radar to the screen. 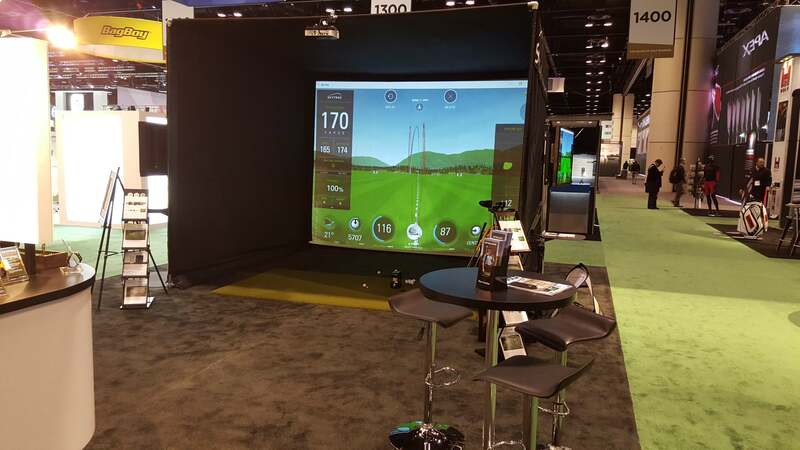 Flightscope also uses Tru Golf E6 Software when used as a golf simulator. GolfZon is a simulator from Korea and has its own course software including 8 European, 12 U.S., 17 Japanese, 9 Chinese, and over 85 Korean. It uses either infra red cameras or a high-speed camera system depending what system you go for. Also has an impressive inbuilt video coaching System. GC2 from Foresight Sports is a camera system in its own box which is totally portable. It has it’s own Golf simulator software called FSX which has fantastic graphics and can be set up as a simulator in the home, office or just take it down the range. Highly accurate and impressive to use at a cost. SkyTrak is also a camera in a box like GC2 and just as accurate without the price tag. Easy to use and totally portable you can play at the range or turn it into a golf simulator. SkyTrak comes with 4 Golf Simulator options WGT for Ipad only, E6 Tru Golf for PC and a yearly subscription, Jack Nicklaus Perfect Golf, Also a yearly subscription or The Golf Club which is an outright purchase. 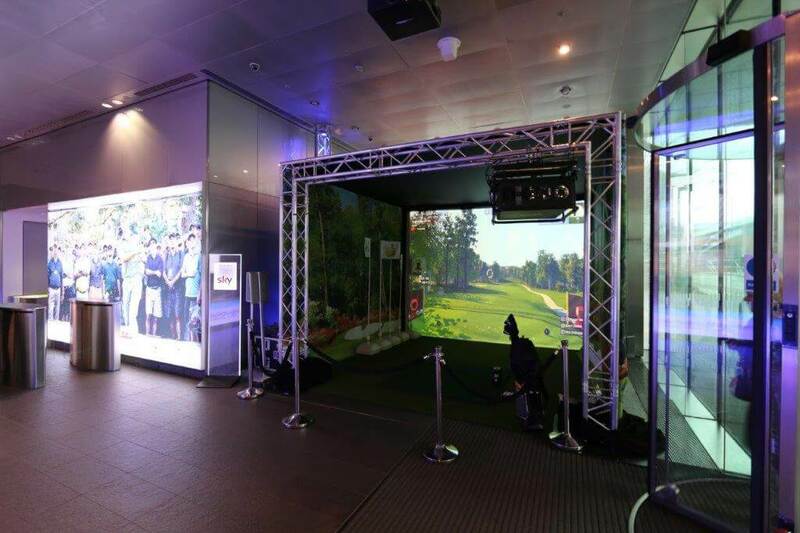 Take a look at some of our golf simulator installations on our Blog.